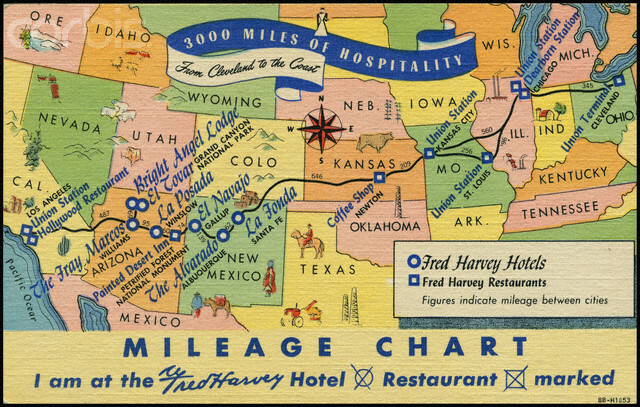 The Fred Harvey Company operated restaurants, cafes and hotels along the Santa Fe railroad primarily in the western and mid-western states of North America. A total of eighty-four Fred Harvey facilities operated along the western routes of the Santa Fe and were located in strategic rail stops offering patrons a place to rest and dine a lavish meal such as the La Fonda Hotel. This dessert was a favorite of rail patrons for years and is adapted from the dessert section recipe found on page 300 in the book Dining By Rail, published in 1993 by James Porterfield. The original recipe is listed first, and then my updated version with a few minor changes. Combining my love of fallen flag railroads and cooking, here is another featured dining car recipe which originally appeared in my Food Buzz “24 Meals, 24 Hours, 24 Blog’s” for February 2009 entitled, Foodbuzz 24,24,24: Celebrating and Reliving A History of Fine Dining on North American Railroads. The current La Fonda Hotel was built in 1922 on the site of previous inns. In 1925 it was acquired by the Atchison, Topeka & Santa Fe Railroad, which leased it to Fred Harvey. From 1926 to 1968, La Fonda was one of the Harvey Houses, a renowned chain of fine hotels. Since 1968, La Fonda became locally owned and operated and has continued a tradition of warm hospitality, excellent service and modern amenities while maintaining its historic integrity and architectural authenticity. The La Fonda Hotel is still in operation today in the heart of Santa Fe, New Mexico. 1. Crush graham crackers fine using a rolling pin and set aside for a later use. 2. Butter bottom and sides of baking pan and set aside. 3. Separate egg yolks from whites. In medium mixing bowl, beat eggs until thickened and of a lemon color. Continue beating constantly as you gradually add the sugar. 4. Into the egg yolk and sugar mixture, fold in the graham cracker crumbs, salt, chopped nuts, vanilla, and baking powder. 5. Beat egg whites until light peaks form, then fold into the other mixture. 6. Pour the mixture into a baking pan and bake for 45 minutes, or until inserted knife blade come out clean. 7. Remove baking pan to wire rack and let cook for 10 minutes. 8. Remove the pudding from the pan and cut into 2-inch squares. 9. Serve topped with whipped cream and sprinkle of chopped walnuts. 4. Into the egg yolk and sugar mixture, fold in the 1 cup graham cracker crumbs, salt, ½ cup of the chopped nuts, vanilla, baking powder and cocoa powder. 8. Remove the pudding from the pan and cut into 9 even squares. 9. Serve each portion topped evenly with whipped cream, then sprinkle on top the graham cracker crumbs, a sprinkle of chopped walnuts and then the chocolate syrup. What a mouth-watering dessert! I really need a big serving of that. Whoa. This sounds too good! You’re killing me with all of these wonderful sweet treats! I never had La Fonda Pudding but this is something I definitely have to try! We’ve traveled to Santa Fe several times. The food at La Fonda is always outstanding. This sounds delicious. this look amazing! i can’t wait to try it! Oh, my! This sounds divine. A definite must-try. One question, though – what size baking pan? Maybe an 8×8? Fred Harvey did a nice job with the Grand Canyon Hotel as well—love this dessert! Lana, yes an 8″X8″ or 9″X9″ pan would work best for the dish when prepared in the single batch. Interesting. Delicious ! Thank you for sharing. Cheers ! I live near Santa Fe and I never knew this about the La Fonda– thanks for sharing the background! I love the La Fonda. 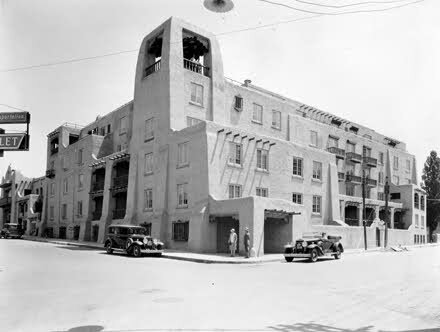 It’s one of the few major hotels in Santa Fe that still speaks of the old city. This sounds like a great dessert. oh, that looks sinfully delicious! Chef Ryan: Thanks to Google Alerts, although it took a year to happen, your work in this area has come to my attention. I’d welcome communicating with your directly about your experience with rail dining so far. Drop me a line. When adapting add chocolate – love it! I’m not familiar with the hotels but the pudding looks mouthwatering. Love the chocolate syrup too. I love this! My dad worked for and retired a Roadmaster for the Santa Fe. We rode the passenger trains from time to time. The dining car was magical for a youngster like me then! Thanks for the memories!